Have you ever wondered about the complexities of American Sign Language (ASL)? Deaf people use it all the time to communicate. But to those who don’t know the language, for that is what it is – a language - watching the communicating process looks like a demonstration of fast moving fingers and hand impressions. In other words, it looks complicated, much like a foreign aural language sounds complicated to someone who has never learned the foreign language. All it takes is a simple comprehension of how the mind works to assimilate signs and symbols and an appreciation of how language is constructed. Then the learning can begin. Anyone can learn ASL, once they understand some of the basics and once they appreciate some of the ways the mind categorizes different parts of language: nouns, verbs, etc. 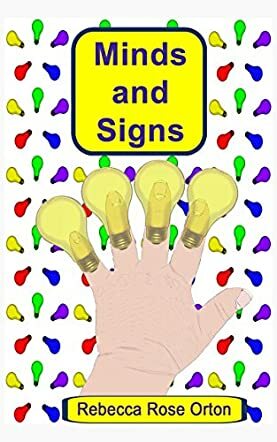 Rebecca Rose Orton’s concise chapbook, Minds and Signs, is intended to introduce young people to ASL and how the workings of the human mind distinguish between the various hand signs and symbols. It’s really not as complicated as it looks when watching deaf people communicate with their hands. In fact, some of the hand signs that demonstrate various mind-related concepts, like stupid and understand, are similar to hand signs aural people use to communicate in a visual capacity. Much like how we pick up certain words or phrases from other foreign languages and use them as expressions to complement similar concepts in our native tongue. This is an interesting and intellectual look at how the mind works, particularly in regards to language and communicating.